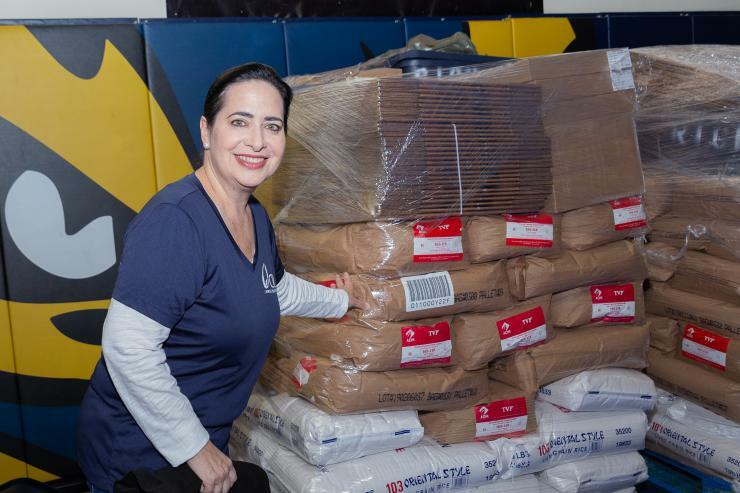 Ana Gloria Rivas-Vazquez, Catholic Relief Services development director for Miami, points to the supplies of rice and other materials needed for the Helping Hands project. 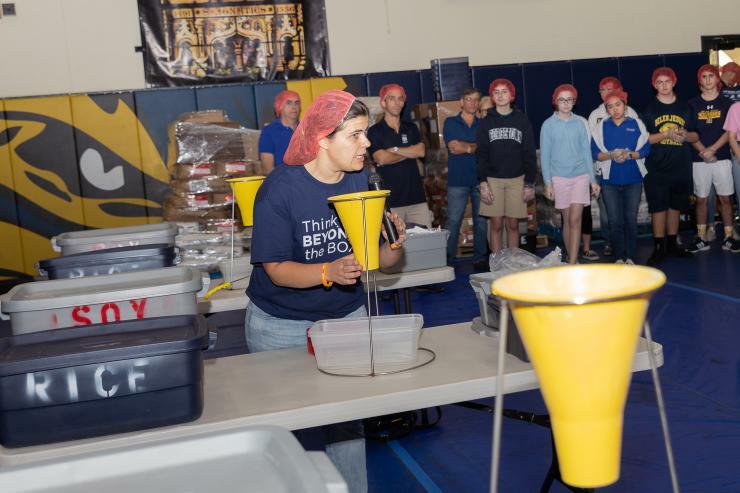 Layla Cupertino, from Stop Hunger and Catholic Relief Services, explains the meal-packing process to the volunteers, including the kind of product and quantity that must be poured in each bag. Bags are handed off to the weigh-in station where rice is added or removed before the bag is sealed. Belen ninth grader Thomas Torres carries a bag of rice to a refilling station. A view of how volunteers and assistants work at their stations to pack meals for the poor helped by Catholic Relief Services in Burkina Faso, West Africa. 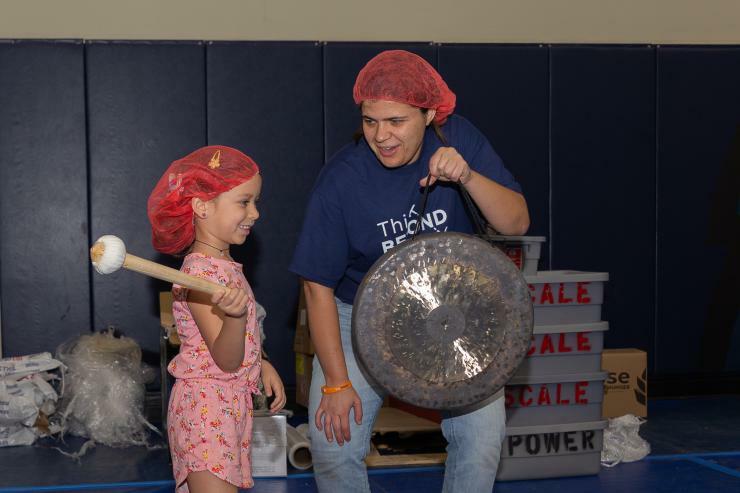 Marisa Rivas Vazquez, 5, a preK student at Banyan Day School, prepares to hit the bell once 2,000 bags have been packed. 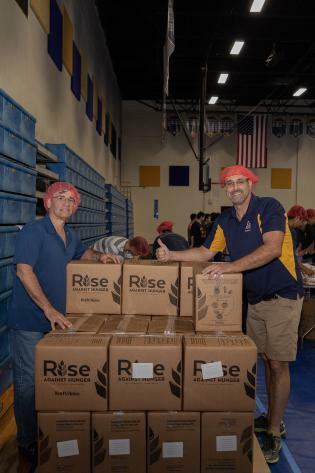 Peter Lopez, left, and Edely Muñoz, of Belen Jesuit's class of 1986, close the boxes after the meals have been completed packed, weighed, and sealed with the proper label. They then go in pallets ready to be shipped to Burkina Faso, West Africa. 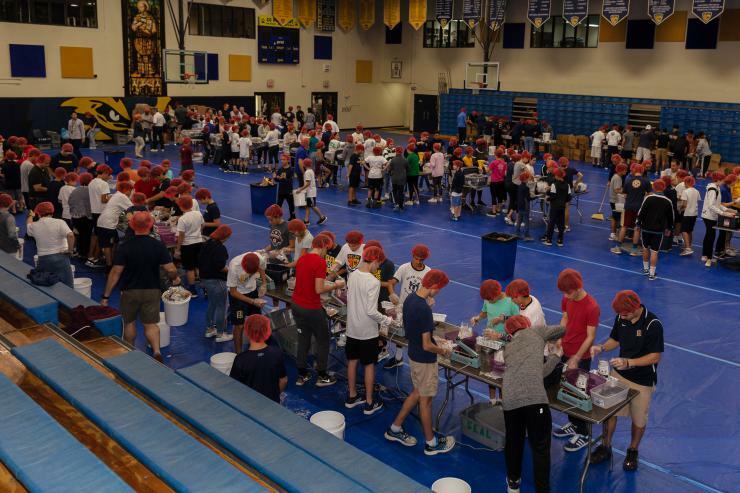 MIAMI | Dozens of local students packed over 38,000 meals for the poorest of the poor in Burkina Faso, West Africa, as part of a project to benefit Catholic Relief Services. Belen Jesuit Prep hosted the event March 30, which was sponsored by the Belen Alumni Association and the Knights of Columbus Miami Council 1726. Students from Belen, Our Lady of Lourdes Academy, Carrollton School of the Sacred Heart, , St. Brendan High and other schools participated in the event. 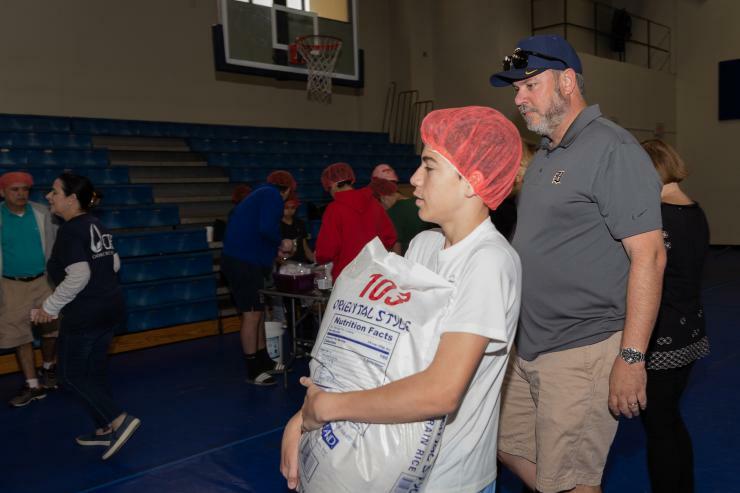 The event began at 8 a.m. with a Mass celebrated by Belen’s president, Jesuit Father Guillermo García-Tuñón, in the Roca Theater followed by the meal packing event in the Roberto Goizueta Athletic Center. Catholic Relief Services | Helping Hands is a Catholic volunteer and formation event that allows participants to serve their brothers and sisters overseas in a tangible way. Volunteers team up to package meals to send to people who suffer from chronic hunger as a result of cyclical drought and flooding in the African nation of Burkina Faso. In addition, CRS Helping Hands funds longer term, income-generating projects that allow people in that nation to build a future free from hunger. Another meal-packing event will be hosted April 11, 12 and 13 by Our Lady of Lourdes Parish in Miami. For more information, go to https://helpinghands.crs.org/.